Rafele is offering up a delicious menu for Thanksgiving. They’ll have a roasted organic turkey with pork belly(!) served alongside a pomegranate polenta – YUM! The added bonus here is a delicious pasta to start. Butternut squash, burrata, ricotta, and parmesan filled ravioli with butter and sage. Drooling. And don’t forget about dessert – a chocolate ricotta twist on their famous cheesecake or a taste of ‘Mamma Fedora’s apple pie’ is sure to send you off in a festive mood. Il Buco Alimentari e Vineria is doing a beautiful Thanksgiving menu, with decadent family-style sides and your choice of antipasti and main courses. Imagine sides such as sage spigarello, anchovy sourdough stuffing, Calabrian chili – let your mind and tastebuds linger on that. Traditional meets unique with your choices – you could go with a minestrone and turkey or switch it up and go with cured striped bass and halibut or roasted heritage pork. And beautiful extends to the space as well. In short, Il Buco Alimentari e Vineria does everything right. 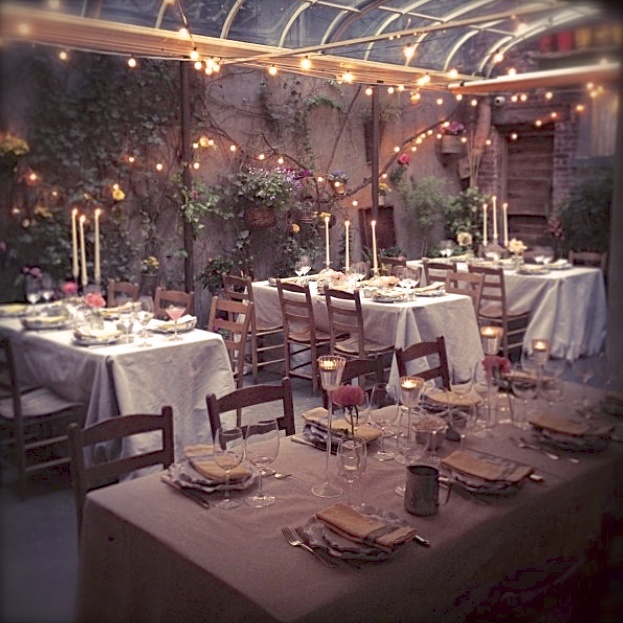 Both the cuisine and the space are reminiscent of a rustic market straight out of Tuscany. 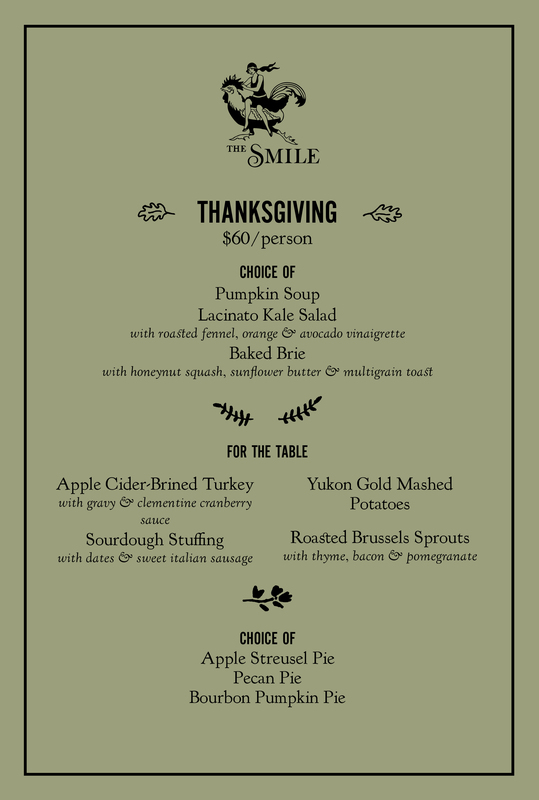 The Smile is a beautiful space in Nolita offering a LOT of food to satisfy all of your deep Thanksgiving day desires. Start with a choice of pumpkin soup, lacinto kale salad or baked brie (brie please!). 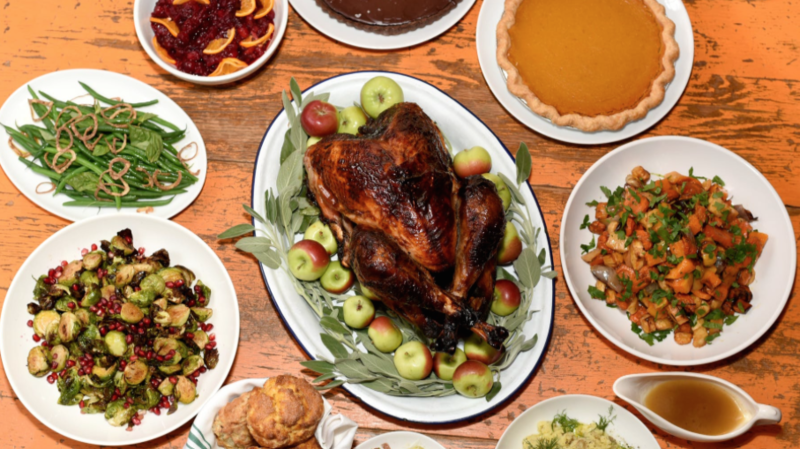 Alongside their apple-cider brined turkey, you’ll get a delectable array of sides from sourdough stuffing to yukon gold mashed potatoes to brussel sprouts with pomegranate and bacon. The classics leveled WAY up. Top it off with a bourbon pumpkin pie or an apple streusel and you’ll be guaranteed to roll home full and happy. P.S. Only the cool kids need apply: This place is hipper than Brooklyn. Viewing this amazing converted farmhouse is a must for any NYC visit. But come for the Thanksgiving fare and you’ll have an experience you’ll never forget. Fresh flowers adorn every inch of this 1810 carriage house, embracing you with warmth and a familial spirit. Tuck into fabulous antipasti and then either spinach and ricotta dumplings or butternut squash pasta, before choosing turkey or porchetta as your main. An heirloom apple crostata completes your delectable dining experience at Palma. At this cozy neighborhood staple, traditional options abound OR change it up with moroccan hummus and New Zealand rack of lamb. Finish it off with a Kentucky bourbon and chocolate pecan tart before walking it off in the tree-lined streets of the Village. Plenty of traditional and unique options sure to impress (you’re going to pass it off as your own cooking, right? Pro tip: Just throw the containers far, far away ahead of time!). Artisanal cheeses and charcuterie to start, traditional turkey and interesting sides for the main course (sourdough stuffing! ), & bourbon pumpkin pie to close it out. Home run holiday! A la carte: sides, a fully cooked or ready to roast turkey, delectable homemade breads, cheese and salumi platters, and dessert. Spiced apple cake or fairytale pumpkin pie – I want to be a part of this fairytale! The whole she-bang – turkey and sides feeding 6-8 people for $265.00. Worth it to not have to cook AT ALL? Yes! Place your order online, over the phone, or by email.